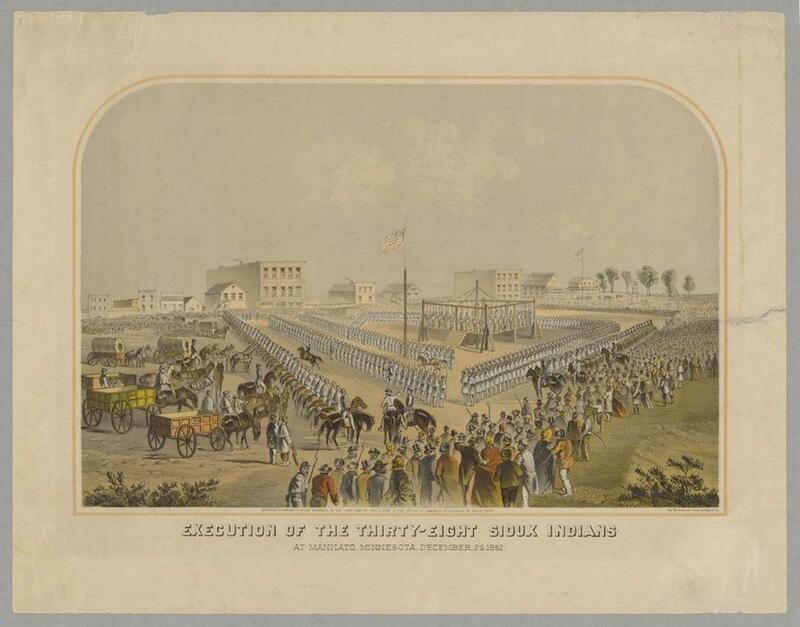 On this date in 1862, 38 rebellious Sioux were hanged in Mankato, Minnesota, in the largest mass execution in U.S. history. Fully 303 had been condemned to die in drumhead trials after the five-week Dakota War, one of the numerous native conflicts sparked by the march of European settlers across North America. Fateful “if” — but politicians say many things, after all, and it was long before Lincoln went to Ford’s Theater that the tribes had been forced out of Minnesota, scattered to wasteland reservations and subsequent clashes with the American army. On this day, all that doleful future was prefigured in the 38 who hanged together in what is now Mankato’s Reconciliation Park, an event that after a century’s time has become a moment for commemoration. Two academics’ pages on the Dakota War and its aftermath are here and here. *One of those was subsequently spared over uncertainty of the evidence against him.